I feel the same, but I´m relatively new to the hobby, too many ideas in my head and not enough time. But time will come eventually. :-) BTW I got the same arrangement for construction space. It´s a must when you got a 1,5 year old. Every time the weekend rolls around I keep thinking that I'll get around to reorganizing the shack, which has been pretty much in shambles for nearly a year now. But my problem is that I always turn on the radio whenever I'm in there and I end up spending all of my time just pushing the crap out of the way and making contacts. I guess in the end that's more important than a neat shack anyway, right? Having a dedicated work area like you have is a great idea, though. It would sure cut down on the clutter in my case. A few weeks ago, I also tired of belated blathering on blogs and placed a little "comment about comments" near the header of my radio web page. Among a few other things, it says "Opinions are like pockets on a shirt, everyone has one". "Most successful people are unhappy. That's why they are successes - they have to reassure themselves about themselves by achieving something that the world will notice... The happy people are failures because they are on such good terms with themselves that they don't give a damn". To me, that's another way of saying a ham can be perfectly happy using a simple wire antenna along with low power. 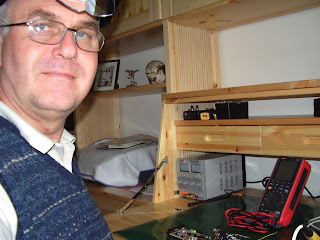 It also says it's a cockamamie idea to think, in order to be successful ham radio operator, you need a KW and a Beam. It's just not true. I also live in close quarters and am forced to use the "stealth" mode of operation. But I love how I operate and the advantages it gives me with portable use. I worked six stations today in locations covering the entire east coast. All were using a simple wire antenna with no gain. The last one was a former Navy chief petty officer sitting in his camper in Florida. There’s probably someone reading this blog today that will make a comment like “ I worked Australia today with my KW and beam…what’s the big deal? My answer to that would be that I had just as much fun talking to a guy in a camper, does it make any difference? I don’t need that to feel successful. Your statement that: “the real test of a ham radio station is whether it allows you to pursue enough activities to maintain interest in the hobby “ is right on. Yes Julian it's very important to keep the hobby fresh. I find by just trying to keep it fresh it does just that. As for a work space I too have a dedicated area for that. I have been in the process of trying to finish up an Elecraft KPA100. Once that's done there is the KAT100 that is next up to be done. I, like you have very limited space and my 20 meter attic dipole continues to amaze me. Got the KRX3 this week, installed it and am playing with it.....Julian there is just not 48 hours in a day!! !